Some more highlights from the two final days of the SEG Annual Meeting in Houston. Protect the base — Fighting the decline of current production is more challenging than growing production. Deepwater — Recent advances in drilling are providing access to larger fields in deep water, and compressed sampling in seismic will make exploration more efficient. Unconventionals — In regard to the shale gas frenzy, it is not yet obvious why these reservoirs produce the way that they do. Also, since resource plays are so massive, a big challenge will be shooting larger surveys on land. Environment and safety — Containment assurance is more critical than pay-zone management, and geophysics will find an expanding role in preventing and diagnosing environmental and safety issues. People — Corporations are concerned about maintaining world class people. Which will only become more difficult as the demographic bump of senior knowledge heads off into retirement. The Calgary crowd that harvested the list of unsolved problems at our unsession in May touched on many of these points, and identified many others that went unmentioned in this session. Isotropy is no longer an acceptable approximation. It is conceptually flawed to relate Young's modulus (an elastic property), to brittleness (a mode of failure). Abolish the terms vertically transverse isotropy (VTI), and horizontally transverse isotropy (HTI) from our vocabulary; how confusing to have types of anisotropy with isotropy in the name! Use polar anisotropy (for VTI), and azimuthal anisotropy (for HTI) instead. λ13 is a simple expression of P-wave modulus M, and Thomsen's polar anisotropy parameter δ, so it should be attainable with logs. Bill Goodway, whose work with elasticity has been criticized by Thomsen, walked to the microphone and pointed out to both the speaker and audience, that the tractability of λ13 is what he has been saying all along. Colin Sayers then stood up to reiterate that geomechanics is the statistics of extremes. Anisotropic rock physics is uncontestable, but the challenge remains to find correlations with things we actually measure. 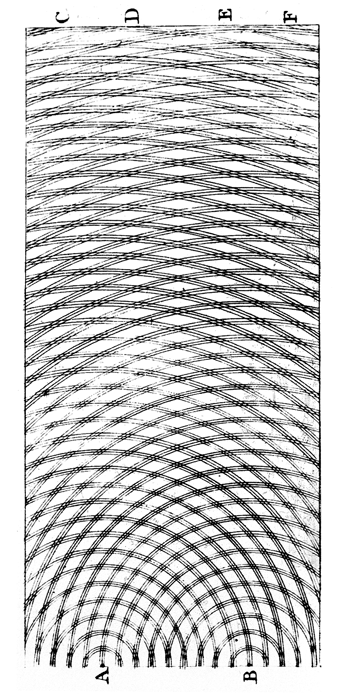 Thomas Young's sketch of 2-slit diffraction, which he showed to the Royal Society in 1803. The Santos, Campos, and Espirito Basins off the coast of Brazil contain prolific oil discoveries and, through the application of plate tectonics, explorers have been able to extend the play concepts to offshore western Africa. John Dribus, Geological Advisor at Schlumberger, described a number of discoveries as 'kissing cousins' on either side of the Atlantic, using fundamental concepts of continental margin systems and plate tectonics (read more here). He spoke passionately about big ideas, and acknowledged collaboration as a necessity: 'if we don't share our knowledge we re-invent the wheel, and we can't do that any longer'. Seismic imaging around 2005 started dealing with anisotropy appropriately, getting the images right. Improved understanding of maturation and petroleum system elements that we didn’t have before. Access to places we didn’t have access to before. Although the workshop format isn't all that different from the relentless PowerPoint of the technical talks, it did have an entirely different feeling. Was it the ample discussion time, or the fact that the trade show, now packed neatly in plywood boxes, boosted the signal:noise? Did you see anything remarkable at a workshop last week?